Went in to see if had improved under new management - has actually got worse! Can't be bothered to list all the crap aspects but my hearing still hasn't recovered after being subjected to the ear bleedingly loud music. 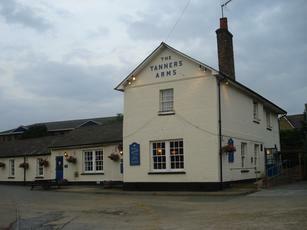 Large pub, tied to McMullen's Hertfordshire brewery, so several local ales available, often cheaper than most other town centre pubs too. Selection of bottled and draught lagers and ciders. Seperate bar and lounge plus a seperate pool and darts room. Small beer garden to the rear and to the side of the pub. Large car park (useful as the pub isn't particularly close to the town or residential areas). Quiz night once a week. Friendly staff. Not usually too busy. This pub always leaves me feeling disappointed, it should be a decent boozer. McMullen's house so always a choice of real ales but they always seem to be in that grey area of being slightly "off" but never bad enough to take back. Outside seating area, pool tables, food served (but I've never tried it), restricted opening hours.